There’s no better way to tick off the multicultural monuments of Montreal than on a small-group sightseeing tour. Over six hours and in an intimate group limited to 14 guests, you’ll explore Old Montreal (Vieux-Montreal) — home to the Old Port, Place d’Armes, and Notre-Dame Basilica — and visit Mount Royal. See, too, the upscale neighborhood of Westmount and enjoy panoramic views from the Kondiaronk Lookout. Hotel pickup and drop-off are included. Your sightseeing tour begins with pickup from your Montreal accommodation at 9:30am, when you’ll board an air-conditioned vehicle to greet your driver and guide. On arrival in Old Montreal (Vieux-Montreal), you’ll set off on a walking tour and discover highlights such as the boutiques and galleries of Rue St-Paul, the Old Part, Bonsecours Market, and Place d’Armes, dominated by the beautiful Notre-Dame Basilica. 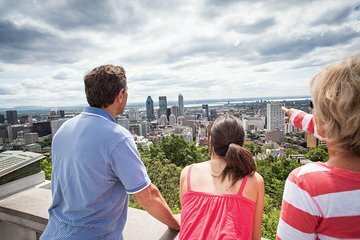 Then, travel past the modern skyscrapers of downtown Montreal, stop at St. Joseph’s Oratory for photo opportunities, and enjoy the greenery of Mont Royal, Montreal’s equivalent to New York’s Central Park, where you’ll absorb panoramic views from Kondiaronk Lookout. After admiring the multi-million dollar homes in Westmount, your tour concludes with hotel drop-off. Our tour guide Natalie was excellent. She combined old town with various ethnic neighborhoods like the English speaking West Mont and Little Italy with its magnificent market place where we had lunch. Natalie was friendly, accommodating, knowledgeable and had a good sense of humor. My wife and I thoroughly enjoyed the tour with Natalie and the driver Natalie and recommend the tour without hesitation. Christian was an excellent guide. His historical knowledge and even-handed approach in presenting potentially biased history provided a rich tapestry of Montreal’s multicultural heritage. Throughout the tour, he was an excellent host and dedicated guide. We highly recommend this tour. Thank you, Christian. Great tour. Fast access to the Notre Dame Basilica. This tour represents the enthusiastic and incredible spirit of Montreal. You get a taste of everything: from the high point at Mount Royal to the underground subway system and shopping malls. The lunch options at the Farmer's Market are excellent. Well worth it! Absolutely outstanding. Never having been to Montreal before, this tour covered everything we needed. Totally enjoyed Stacey as our very informed and personable guide. Thank you so very much!! We really enjoyed the insight that we got from going on a personalized small tour. We saw and did things that we would not have had the time or knowledge to do without a lot of planning. We really enjoyed this tour. The best part was the wonderful and very knowledgeable tour guide. We visited every part of Montreal we wanted to see plus a few pleasant surprises. Our guide provided the perfect amount of explanation of Montreal's history, architecture, neighborhoods, and cultural life. Even better was that there were just four of us on the tour, plus the guide and a driver. Highly recommend this tour!